Our much anticipated State of Texas Rotary License Plate. 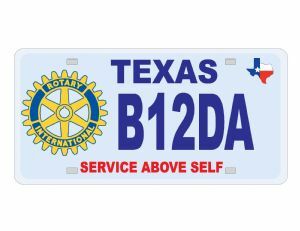 Tom Plumb, Port Isabel Rotary president and Texas Rotary Plate coordinator, anticipates that a Rotary license plate will finally be available in Texas after a 4 year effort, in time for all district conferences in late March or early April. Below are answers to questions presented by Rotarians and answered by TxDMV. "The specialty license plate fee is collected in addition to the regular registration fee and any other applicable fees. From the $30 specialty plate fee, $22 goes to the Texas Department of State Health Services to help fund Tuberculosis (TB) prevention and for improving the delivery of TB prevention and control services. This plate will be available for Passenger, Truck, Motorcycle, Trailer/Travel Trailer, and Private Bus. The plate can be purchased on-line at the TxDMV website. A customer can apply for a specialty plate at any time. That's the simple part. Now, if the customer has a currently registered plate, and the registration period has not expired, the registration month and year may change depending on which expiration is further out. Credit is given for any registration fees previously paid. As an example: Your current general issue plate expires in July 2010. You apply for a Rotary International plate today. Your expiration for the Rotary International plate would be January 2011. In this case the expiration furthest out is January 2011 so you would pay six months registration to sync up the registration and specialty plate fee. You will be able to have five (5) characters on the plate. Motorcycle vanity plates, due to the size of the plate, will only be able to fit four (4) characters on a motorcycle plate which limits the possibilities for personalization."